Live & Style magazine, which also has a weblog, has a necklace give away going on. The deadline is April 2nd, so if you plan to enter, get going. You can find out the detail from their weblog. The necklace (which they provide a photo of on the link I just posted) is hand-crafted from k-ritt jewelry. While they don't provide a lot of detail about what this multi-strand necklace is made of, I'm guessing it is pearls, crystals, and some kind of chain, probably either silver or gold-filled. While Hot Diamonds is probably better known for its jewelry, with special collections available for women and also men, they also carry an interesting assortment of watches. Pictured is a nice watch, sort of a bracelet watch, with a toggle heart-style clasp. Most of their watches have leather straps, but a few have metal link styles as well. Pictured below is a mixture of men and women's watch designs available on the Hot Diamonds web site. According to Mine Web, the Silver Institute has just published a trend report on silver, especially targeting jewelry, and things look pretty good for silver jewelry. This is really not a huge surprise since, while the cost of silver has gone up a good deal over the last year or so, you still can’t beat silver as the most economical metal for jewelry these days. Really, everything has gone up, silver, gold, and platinum. The Silver Institute Thursday released a detailed analysis on trends in the global silver jewelry market conducted by London precious metals consultants GFMS. The study found that silver jewelry consumption is still heavily skewed towards western markets, which pushed fabrication higher in top jewelry manufacturing centers Thailand, Italy and China. In 2005 silver jewelry accounted for one-fifth of total jewelry fabrication and 19% of international silver demand. However, GFMS’s research discovered large differences in the ratio of silver: gold jewelry consumption on an individual country basis. While gold was by far the dominant precious metal on a value basis, GFMS suggested that “in reality, and in particular at the retail level, silver holds its own rather better in the value stakes due to the much higher markups on silver than on gold, platinum or palladium jewelry. For more on silver bullion and market updates, check out buy silver bars, a website devoted to informing buyers and investors of silver. I had lunch with a good friend of mine the other day and she showed me wedding photos of her son's recent wedding in the Bahamas. The bride was gorgeous, your typical 24 year old barbie doll, and her jewelry was beautiful too. While they got married last month, it reminded me that it's just about that time of year for many brides and grooms to be wed. April, May, and June are some of the top months for weddings, especially for college (or soon to be graduates of college) students. As just a little feast for the eye, even if you are an old married gal like myself, here are some gorgeous wedding rings from Kirk Kara. Pictured above is a platinum, diamond, and sapphire set. Yeah for gemstone colors! Here's another set with a hint of 18kt gold. 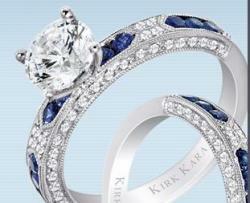 Obviously, he likes sapphires, but I'd love to see these same designs with rubies. 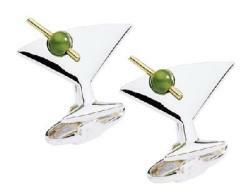 I know…I know….With mother's day around the corner I really need to try to not let myself get distracted with looking at jewelry for men, but when I saw these adorable little martini glass cuff links from jewelry designer Dolan-Bullock I couldn't help but stop. The olive is made from jade – clever, don't you think? Maybe you have an anniversary soon (April, May, June tend to be marriage months), or you just want to bookmark this site for sometime later when you need a little something special for your guy. Here are a few other interesting jewelry designs for me. I especially like the mix of metals – sterling with gold. It gives it a little twist but still looks macho, and it's affordable for the most part. Back in the early nineties when I was actively selling my jewelry, I had one design that used to really freak people out, but it was one of my most popular as well. It included a large crystal with a hematite star on top for one earring and the other earring consisted of hematite stars with either silver beads or small crystal beads in between them. They matched, but yet, they didn't match. Jewelry designer, Denise Solay, also caught on to this trend from way back, but she has taken it a step further and made it (I think) a little more doable for today's woman who has a lot going on and may at one moment need to look traditional but the next moment can let her hair down and have some fun as well. 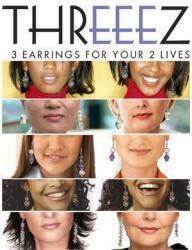 She calls these THREEEZÂ® 3 earrings for your 2 livesâ„¢ and the idea is that two totally match, so you can wear them and be "traditional." And then you have an extra earring that has the same look, but isn't so matchy-matchy. Thus, you can be a little unconventional. The Four Seasons Design Group, who along with jewelry also designs other objects of art for museum galleries, has recreated the works of French designer and artist Erte. This jewelry is very detailed and combines techniques of enamel and well as inlay. Pictured left: Among Erte's sources of inspiration were the fables and myths he learned as a child in Russia. One of the most pervasive of these concerns the beautiful woman and the fearsome beast that is turned into a handsome prince by the beauty's kindness. Available in 14kt. gold with black onyx and mother-of-pearl with precious and semi precious stones. Occasionally, instead of referring back to the original image of the same title, ErtÃ© would reach across for an image to convert to a different subject. In Salome he found his model in another femme fatale – Giulietta, from The Tales of Hoffman – who was the subject of his serigraph of 1983 named for her. Available in sterling silver and vermeil with black onyx background and beads, faux pearls and Swarovski crystals. 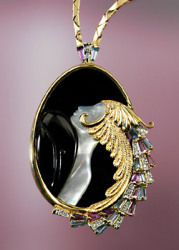 Simply beautiful from the front or the back, this Erte design shows all the creative genius of Erte. From the stark black and white art deco design of the watch face to the sunrise/sunset design on the back, the watch is both a timepiece and a jewelry ornament. 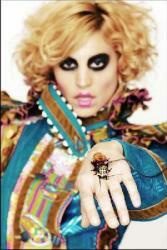 Head designer of Black Chandelier Jared Gold is famous for taking an ironic twist on fashion. His latest fashion craze, the Roach Brooch, uses a proprietary by-hand process to gently bejewel live Madagascar hissing cockroaches with Austrian Swarovski crystal (placed on top of the non-feeling part of the head), which are then accessorized with a leash set and sold ready to wear. Okay, as a native Floridian, it's not like I am a roach activist. I've killed my share and then some, but, I still can't help but feel like this is just not a nice thing to do. If you are going to hurt a roach, then smash it and be done with it. Don't glue sparkles on its head and attach a leash to the poor thing. If you are fan of the show "America's Next Top Model" then you may already be familiar with the giant Madagascar hissing cockroach brooch. This piece of jewelry is made from a living Madagascar hissing cockroach that is decorated with Austrian Swarovski crystals. This is one of the few pieces of jewelry that you will own that you will also be able to treat like a pet. To care for your giant Madagascar hissing cockroach broach you will need to make sure that you provide it with the right type of housing and food. Your cockroach brooch will need a dark terrarium with soil and leaf litter as its home, and you will need to feed it fresh bananas and provide it with a damp cotton ball or paper towel to provide it with the right amount of water to survive. If you provide your living cockroach jewelry with the proper accommodations then it should live for about a year. However, most vendors that offer this product will not guarantee that it will live this long. The giant Madagascar hissing cockroach broaches are unique accessories, however, you may be wondering when you will be able to wear this piece of insect jewelry. Well there are several occasions that you can wear this item. First they make an elegant addition to a Halloween costume. Besides Halloween this item can also be worn to posh dinner parties, friendly get-together's, as well as special events. Your confidence and style sense is what will allow you to get away with wearing this item as a fashion accessory. There is so much out in the jewelry and fashion blogosphere this week, I decided to do my link round up a day early. Madonna plays fashion designer at H&M with her newly launched "M by Madonna" line, and Fashiontribes is on the (fashionable) case. A fashion geography lesson from Aesthetics + Economics. Bag Snob says: Keep your business to yourself! And I tend to agree. Coquette picks her favorites from Red Dress Shoppe for Spring outfits with a vintage touch. The Louis Vuitton '07 World Cup is almost here. Ebelle5 discovers the new Designer Louis Vuitton Handbags made for this event. abercrombie & Fitch has landed in London, My Fashion Life reviews the hype. Papierblog looks at the criminal element in fashion and breaks down some of thier most recent public offenses. Stylebites is giving away a fab necklace and the secrets to wearing springs jewelry trends. Kristopher has spring fever – she lusts to stand taller and touch 24 karats of sunshine. Second City Style reports on the attack of the anorak (for spring). StyleBakery.com finds the perfect little 24-hour Spring dress – and it's less than $90. Read Stylehive's interview with Monster Factory who creates and brings to life fun and whimsical handmade plush little monsters. eBeautyDaily tackles the big pores in her life. Girlawhirl's confidence gets a little boost from Dr. Perricone. Jewelry and Beading as some thoughts on jewelry design protocol. The Bling Blog spots some wonderful rings in the latest Neiman Marcus catalog.